The head of the Kellankoski Rapids is a really delicious fly-fishing spot. From a Finnish rapids angler’s point of view, Central Finland is definitely the most rewarding place to seek wonderful trout-fishing experiences. This region is home to several scenic, highly esteemed and well-managed rapids sites, where catching a brown trout on the end of your line is more of a rule than an exception. You should bear in mind, however, that rod quotas are applied on many rapids, so you’d do well to get a fishing licence in advance to ensure access to fishing grounds. In addition, the closed season for trout also shuts down fishing sites for the period from 1st September to 30th November. A view over the Äyskoski Rapids from a footbridge crossing the river. Located in the headwaters of the River Kymijoki water body, the Rautalammi route is the most famous rapids route in Finland. 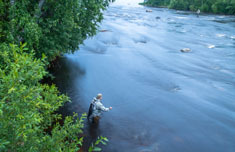 The route covers several pristine rapids protected under the Act on the Protection of Rapids, where the primary target species is brown trout, the regional fish of Central Finland. By far the most famous fishing site on this route is the Äyskoski Rapids in Tervo, also known as the Lohimaa resort, or ‘Salmon Land’. Stretching about one kilometre in length, this fairly gently flowing stream is easy to wade and offers countless delicious hot spots from its head all the way to the downstream run. Due to the ‘catch and release’ practice, it’s possible to catch quite large brown trout and grayling in the rapids, in particular in the lower sections. With its hotels, restaurants, cottages and complementary services, the amenities available in the Äyskoski Rapids area are beyond compare in Finland. At a small distance downstream along the same route, between Lakes Konnevesi and Kynsivesi, runs a series of seven intriguing rapids. Until recently, almost all of these used to be closed fishing sites for small groups, but the Municipality of Konnevesi acquired majority ownership in the rapids from a power company in 2012 and started to open the sites up to the general public. The Hannulankoski Rapids is the realm of big trout. Wild fish with adipose fins must be released here. The most famous of the septet is the limpid Siikakoski Rapids, right at the outlet of Lake Konnevesi, where the late President Urho Kekkonen was a regular visitor. A hundred metres wide and a couple of hundred metres long, this rapids site offers excellent chances of tricking even quite big trout and grayling, as fishing is only allowed on the ‘catch and release’ principle. Next in line when moving downstream run the smaller-scale Karinkoski and Taikinainen Rapids, followed by a longish leg of quiet waters leading to the racing surge of the Kellankoski Rapids, the fastest and most handsome site of the route. There are several hot spots within this 600-metre stretch, but the largest trout are generally caught in the upper section of the rapids. In the downstream pool, your lure may even be snatched by a ten-kilo pike. After a couple of lake basins starts a trio of rapids known as the Korhola Rapids, the lower two of which – Keskisenkoski and Hannulankoski – are open to anyone with a licence. Perhaps the best chances of catching big trout are on the Hannulankoski Rapids that empties into Lake Kynsivesi, right at the beginning of the fishing season when smelt-hunting trout enter the stream. The Keskinsenkoski Rapids, in turn, is a better spot for catching grayling. Lower part of Huopanankoski Rapids. 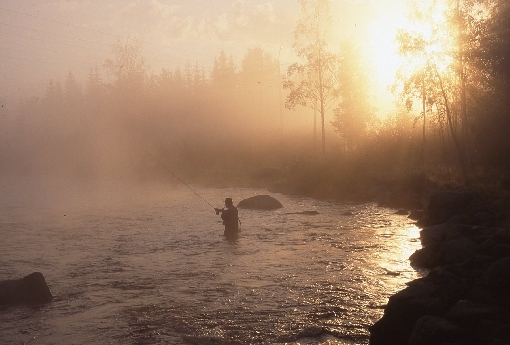 Viitasaari is perhaps the number one municipality in Finland in terms of fishing for brown trout on rapids. Within its area, nature has shaped several splendid rapids, which have been used by rod anglers for decades, the best ever since the 19th century. Between Lakes Kolima and Keitele lies a series of three smallish but intriguing rapids licence areas. The uppermost Kärnä Rapids starts right at the outlet of Lake Kolima. The longest of the trio, this stretch of rapids races quite quickly in places and offers fishing spots over a distance of almost one kilometre. The proximity of Lake Kolima increases the odds of finding even big trout and the February Red stonefly season in the spring is worth experiencing here, as well as on the other rapids along the route. The intervening pool upstream from the road bridge, with its bottom and head sections, is a good place to start. The Kellankoski and Kylmiönkoski Rapids a few kilometres downstream are only a couple of hundred metres long, but they still offer an abundance of great hot spots. 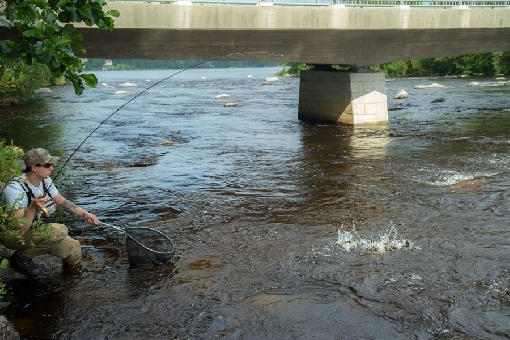 Many fly-fishing enthusiasts enjoy the downstream run of the Kellankoski Rapids and the wide head of the Kymönkoski Rapids, which is easy to wade. The Huopanankoski Rapids, located to the west of the centre of Viitasaari, is a legend thanks to Juhani Aho, one of Finland’s national authors. 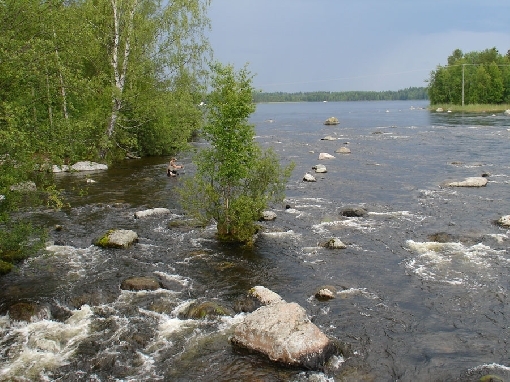 It isn’t difficult to see why Mr. Aho took a shine to the site, as this chain of rapids and pools stretching over a distance of just below one kilometre still provides a splendid setting for fishing even today. Most trout specimens are caught from the area between two bridges, but it’s also worth checking out the calmer Alakoski Rapids. Close to the Huopanankoski Rapids, on the other side of Lake Muuruejärvi, flows the leisurely Keihärinkoski Rapids with a strong scent of trout. This just under half-kilometre stretch of rapids emptying into Lake Keitele yields regular catches of big trout, in particular in the spring and early summer when small fish rise upriver. Grayling is also a common catch. 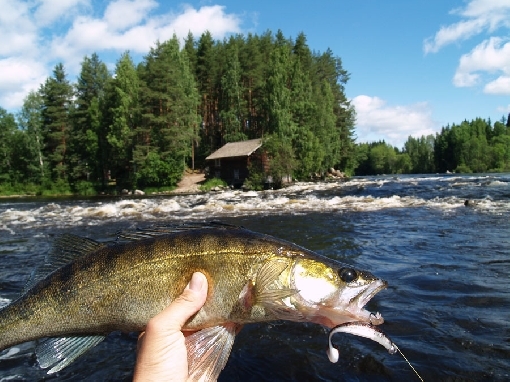 The Lake Saarijärvi route covers a couple of dozen rapids, some of which are even nationally renowned fishing sites. 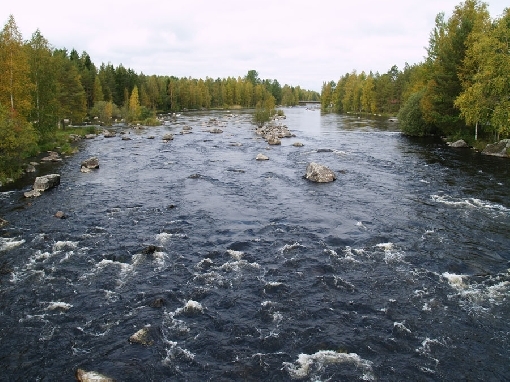 Stretching more than two kilometres, the Heijostenkosket rapids area is by far the longest leg of the route, consisting of five closely set rapids connected by slow-flowing pools. The dark waters of this untamed cluster of rapids spring from Lake Pääjärvi in Karstula and the site offers enough spots to rummage to fill even a longer day. The primary target species are brown trout and grayling. 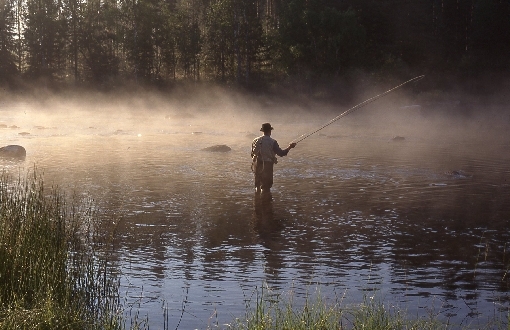 Downstream on the route, you’ll meet the Tuhmakoski, Kalmukoski, Haapakoski, Muittarinkoski, Riekonkoski and Majakoski Rapids, which are all open to anglers without rod quotas and may yield ‘anything’ on a good day. You can also fish on the Kapeenkoski Rapids in winter. 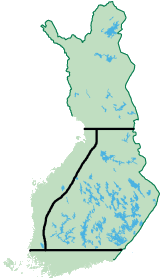 More significant sites in terms of fishing tourism, however, are not found until the Kapeenkoski and Kuusankoski Rapids, which are located on the ends of Lake Vatiajärvi to the south of Äänekoski and offer accommodation, catering and tourism activity services alongside first-rate fishing opportunities. The uppermost of these, the Luijankoski-Kapeenkoski area, is an over a kilometre long collection of two fast-flowing rapids, races and pools in an exquisite ridge scenery. 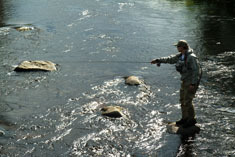 In the rapids area, challenges are provided by trout and grayling, while there are good opportunities to jig for zander, for example, below the Kapeenkoski Rapids with its old mill scenery. In its upper section, the Kuusaankoski Rapids is a fierce-flowing gush and its broad neck is one of the most reliable trout spots in Central Finland. Sizeable specimens are, however, seldom caught here. It’s also worth scouring the intervening pool and the lower stretches of the rapids carefully. Here, trout are also eager to strike lures in winter. 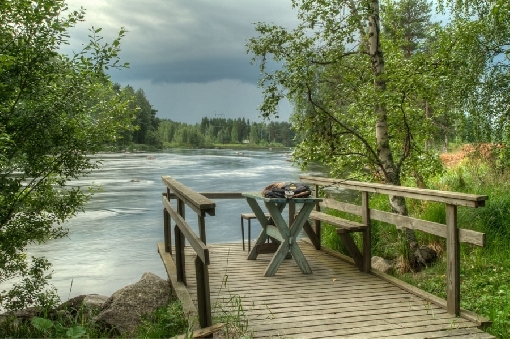 Keihärinkoski Rapids in Viitasaari in Central Finland is a destination intended solely for fly fishing. The rapids are about 400 metres long and the most sought-after fish swimming in them is the strong, naturally-spawning trout. While these rapids have naturally spawning fish, they are also stocked with planted trout. You can tell a naturally-spawned fish apart from a planted one by the fact that a naturally-spawned fish still has its adipose fin whereas planted fish have had theirs clipped off. In addition to trout, Keihärinkoski also has plenty of grayling. 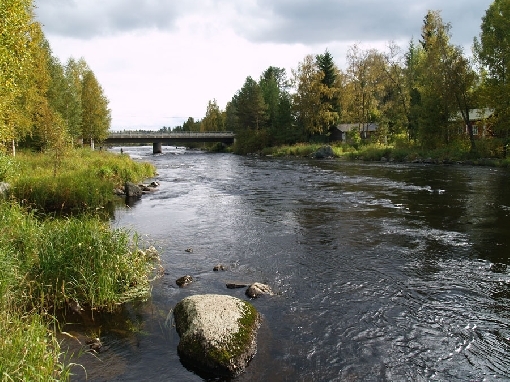 The Keihärinkoski Rapids flows leisurely with a strong scent of trout. The first 200 metres of the rapids are relatively calm waters. There are large rocks here and there, leaving plenty of cosy places for trout to hide. 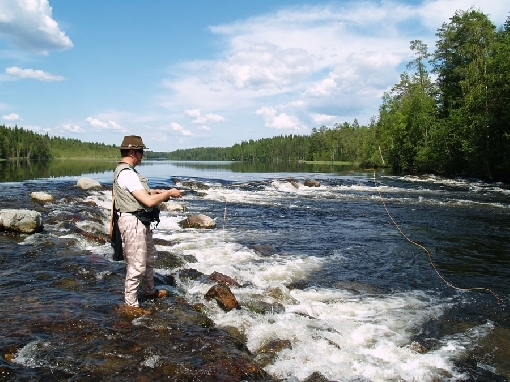 Keihärinkoski is an ideal destination for fishing with dry flies. A little bit after the halfway point, the river makes a 90 degree turn and runs under a road bridge. Here you will find grayling. 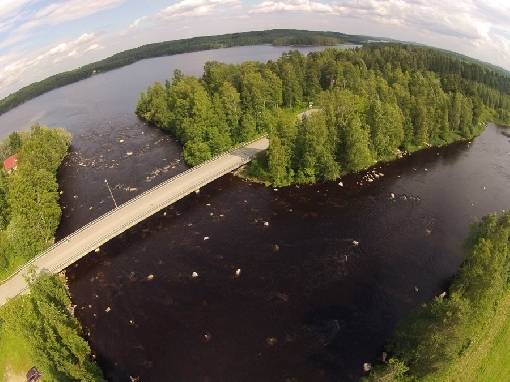 Once the river has cleared the bridge it arrives at the fiercest section of Keihärinkoski. Small froths form in the middle of the river where the trout like to spend their days when the water is warm. 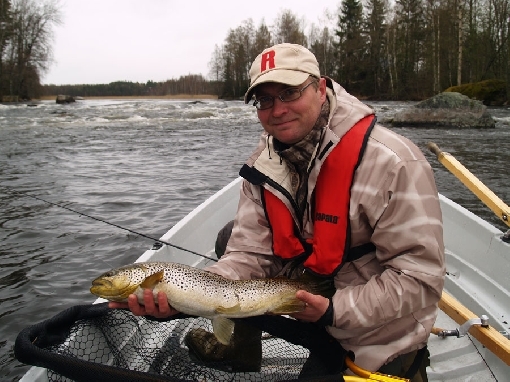 Spring and early summer is a season for big trout on Keihärinkoski Rapids. The section under the bridge has several deep pits that are great for nymphing, for example. Many anglers find interesting the currents that run right along the bank under the broad-leaved trees and bushes. You will need wading equipment at Keihärinkoski. The recommended fly tackle weights are 4–5 and 6–7 for larger flies. When the water is low or at its normal level, you will do fine with floating line, but you might still want to pack a few sinkers for your leader. There is a small parking lot on the western bank on the north side of the road bridge. Next to it is a covered BBQ pit. There are no spaces for setting up a tent or parking a caravan along the river. 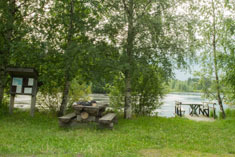 A rental cottage is available on the eastern bank of the river.